If I had to explain the big idea of her book in an old school SAT analogy, it'd be vulnerability : good :: shame : bad. She spends a lot of time on how destructive (but pervasive) shame is in parenting, at the job/school, pretty much in anything. And she defines shame as the difference between, “I am bad” and “I did something bad” (the latter statement reflecting the more productive feeling of guilt). The distinction reminds me a lot of How to Talk so Kids Will Listen’s dos and don’ts. Along those lines, Daring Greatly expands upon these things that get in the way of us, you know, daring greatly. And provides the “antidote” to those habits. Foreboding Joy (the problem). This happens when you can’t enjoy something because you are so worried about losing whatever brought the joy. Like as soon as you enter a new relationship/job/etc, you start imagining how it will end. Practicing Gratitude (the solution). Brown discusses how she learned the most about overcoming this fear of losing something you cherish from people who had suffered incredible loss: “These included parents whose children had died, family members with terminally ill loved ones, and genocide and trauma survivors." The message from these people was often that “when you honor what you have, you’re honoring what I've lost.” Like this quote from Ronan's mom (the boy who Taylor Swift wrote a song for and sang at Stand Up To Cancer): “I watch everyone else in life with their beautiful kids. I sit and wonder to myself, do they know how lucky they are? How lucky they are to be able to just hold the hand of their little ones to cross the street? How lucky they are to deal with a tantrum or go through the terrible twos? Those people I watch from my new set of eyes are so unbelievably lucky.” Gosh, it is hard to even read this quote without wanting to run and grab my girls in a giant, sobbing hug. Perfectionism (the problem). "Perfectionism is, at its core, about trying to earn approval. Most perfectionists grew up being praised for achievement and performance (grades, manners, rule following, people pleasing, appearance, sports.) Somewhere along the way, they adopted this dangerous and debilitating belief system: I am what I accomplish and how well I accomplished it. Please. Perform. Perfect…Healthy striving is self-focused: how can I improve? Perfectionism is other-focused: what will they think? Perfectionism is a hustle. Perfectionism is correlated with depression, anxiety, and addition." Numbing (the problem). Brown emphasized that this is not just drinking or drugs. It is mindlessly eating, watching TV, browsing the internet, playing video games; really it is doing anything, not just illegal or illicit things, to avoid feeling discomfort or vulnerability; i.e., you can do those things because you enjoy them and that is okay, but when you do those things as a long-term avoidance/distraction strategy, you're not really enjoying them anymore and they are becoming destructive. From a parenting perspective, the things that most jumped out at me were the importance of modeling gratitude, self compassion (and compassion towards are children when they are struggling/having a meltdown/etc. ), and boundaries. Brown doesn't give a lot of explicit “do this, not that” parenting advice. But she does underscore how “parents are looking for behaviors, emotions, and thinking patterns that their children have never seen modeled.” So it is more important that we model emotion regulation, mindfulness, etc. than that we Ferberize or breastfeed or whatever (like I talked about here). Brown gets into a lot more issues in her book, these were just the ones I was most interested in. Although I was fascinated by her distinction between "vulnerability" and straight-up TMI. From a blogging perspective (and a ready of Momastery), it was something I'd often wondered about. She also offered some crazy important insights into gender differences in shame (hint: it's not just a woman's issue). 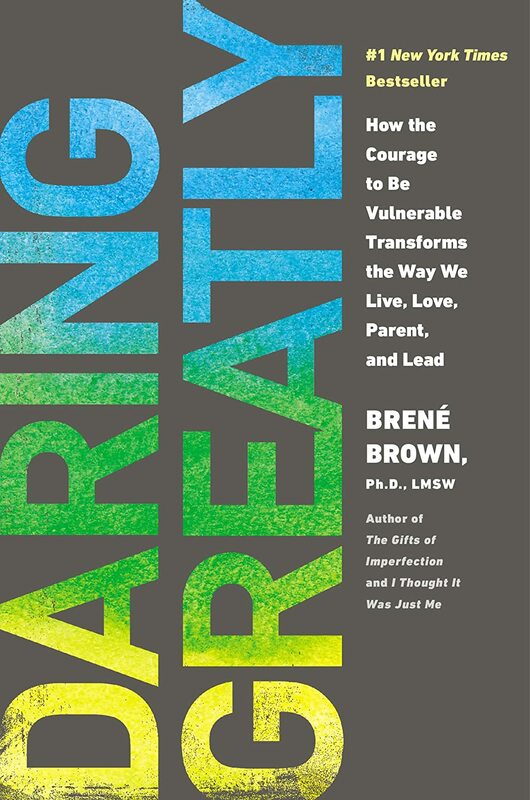 Overall, I definitely enjoyed this book, as I do most anything by Brené Brown.